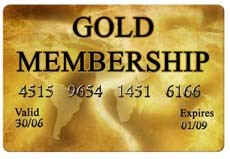 MStore Membership is a comprehensive membership database which allows the control of individual, family and corporate membership. Photographs, and user defined details can be stored in addition to name and address, and contact details. Mail shots are an integral part of managing your membership. Keeping in touch with your members to send birthday messages, newsletters, details of special events or just to send the annual renewal reminder is key to retaining your members. MStore has mail merge facilities to allow you to create customised letters to each member or to send just one letter to the family.The mail merge facility integrates with Microsoft Word and with email to allow you to send correspondance by email or by letter. The New Member Wizard allows you to enroll new members at the point of sale as well as the back office. 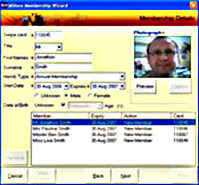 Customer Photographs can be captured when a new member joins using simple web cams attached to the point of sale. These are stored and can be used to validate future admission .